Written by John Ferling, one of America's leading historians of the Revolutionary era, The First of Men offers an illuminating portrait of George Washington's life, with emphasis on his military and political career. 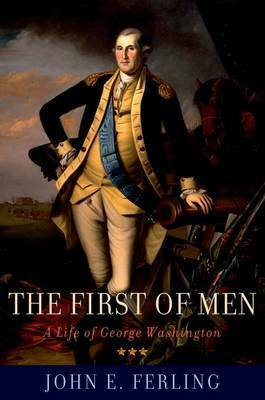 Here is a riveting account that captures Washington in all his complexity, recounting not only Washington's familiar sterling qualities-courage, industry, ability to make difficult decisions, ceaseless striving for self-improvement, love of his family and loyalty to friends-but also his less well known character flaws. Indeed, as Ferling shows, Washington had to overcome many negative traits as he matured into a leader. The young Washington was accused of ingratitude and certain of his letters from this period read as if they were written by "a pompous martinet and a whining, petulant brat." As commander-in-chief of the Continental Army, he lost his temper more than once and indulged flatterers. Aaron Burr found him "a boring, colorless person." As president, he often believed the worst about individual officials. Ferling concludes that Washington's personality and temperament were those of "a self-centered and self-absorbed man, one who since youth had exhibited a fragile self-esteem." And yet he managed to realize virtually every grand design he ever conceived. Ferling's Washington is driven, fired by ambition, envy, and dreams of fame and fortune. Yet his leadership and character galvanized the American Revolution-probably no one else could have kept the war going until the master stroke at Yorktown-and helped the fledgling nation take, and survive, its first unsteady steps. This superb paperback makes available once again an unflinchingly honest and compelling biography of the father of our country. John Ferling is the author of nine books and numerous articles on the American Revolution and early American wars, and has appeared in four television documentaries devoted to the Revolution and the War of Independence. His book A Leap in the Dark won the Fraunces Tavern Book Award as the year's best book on the American Revolution, and Almost a Miracle was named the New York American Revolution Round Table Best Book of 2007 He lives in metropolitan Atlanta.